This week’s #FridayReads is dedicated to N.K. Jemisin for writing amazing fantasy. I feel like I lucked out this morning. My job has a free bookshelf and I found a copy of N.K. 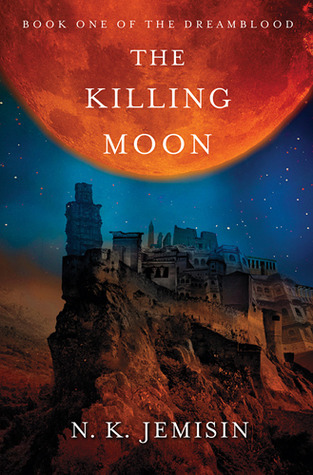 Jemisin’s The Killing Moon, just waiting for me to pick it up! This copy is well-loved by its previous owner. I absolutely fell in love with Jemisin’s writing last year when I read The Fifth Season and I’m super excited for the sequel, The Obelisk Gate, coming out later this month(!!!). I also bought her other book The Hundred Thousand Kingdoms soon after finishing The Fifth Season. And Tqwana reviewed it for the blog last year. She is becoming one of our favorite author’s on this blog and someone who I cannot pass up when looking for new books to get (auto-buy for life). Keep ’em coming, Jemisin! Leave a comment telling us your favorite N.K. Jemisin novel!